Let me repeat that... 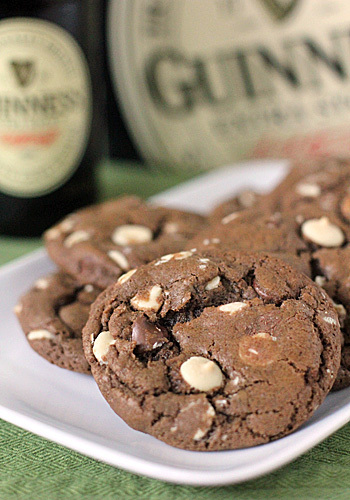 TRIPLE CHOCOLATE GUINNESS COOKIES! Really, do I even need to say anymore? No, but I will ☺. I have put beer in cakes, brownies, and even cheese spread, but beer in a cookie-- this was a first. After reading the recipe I was a bit skeptical. The recipe calls for 2 (12-ounce) bottles of Guinness reduced to a syrup. I thought there would be an overwhelming bitterness to the cookie from the syrup, but boy I was wrong. Completely wrong. The beer syrup is balanced by a trio of chocolates-- cocoa powder, white chocolate, and milk chocolate are joined by an addition of espresso powder. Even with the triple chocolate threat, the overall chocolate flavor is mild enough to let in an essence of stout. I use (and recommend) Guinness extra stout for a deeper flavor. You could use Guinness draught, but I don't think the flavor would come through as nicely. Upon reading the recipe, you'll see that I refrigerate my dough. I find this results in a better textured cookie and it keeps the dough from spreading too quickly in the oven. The dough will keep for several days in the refrigerator and frozen for up to a month. That way I can have fresh from the oven baked cookies for an after school snack, a post dinner treat, or any time a craving calls. I also bake them at a slightly lower temperature to keep the chocolate from scorching and to set the cookie just right. 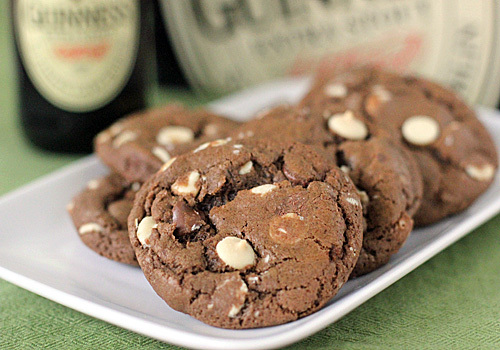 Crispy edges and a tender, chewy (borderline fudgy) middle-- now that's my kind of cookie! In a medium saucepan over medium-high heat, reduce the Guinness and the brown sugar, stirring occasionally to prevent scorching, until thick and syrupy and measures 1/3 cup, about 30-45 minutes. Set aside to cool slightly. In a medium bowl, whisk together the flour, cocoa, espresso powder, baking powder, baking soda, and salt; set aside. In the bowl of a stand mixer fitted with the paddle attachment, cream the butter and sugars until light and fluffy, about 3 minutes. Add the eggs and yolk, one at a time, until combined. Scrape down the sides of the bowl. Add the vanilla and mix until combined. With the mixer on low, gradually add the cooled beer syrup, mixing until combined. Gradually add the dry mixture until no flour is visible. Fold in both the white and milk chocolate chips. Cover the bowl with plastic wrap and refrigerate until firm, about 3 hours, preferably overnight. Well wrapped or stored in an airtight container, dough will keep in the refrigerator for up to 3 days. To freeze, scoop the dough into portions and place on a parchment lined baking sheet. Freeze until firm, then place in a freezer safe plastic bag for up to one month. Preheat the oven to 325° F. Line a large baking sheet with parchment paper. Using a 1-ounce ice cream scoop (about 2 tablespoons), scoop out portions of the cookie dough onto the prepared baking sheet spaced 3 inches apart. Bake the cookies until the edges are set, about 15-17 minutes (a minute or two more if frozen). Allow the cookies to cool on the baking sheet for 2 minutes, then transfer to a wire rack to cool completely. Enjoy! Second attempt at Guiness Syrup on the stove. Burnt Guiness syrup and stinky smoke has not deterred me from making these for a bunch of cyclists on St Paddy's Day. Will let you know how they like them. Oh, no. Try turning down the heat a bit. Just make sure that it doesn't cook so long that you wind up with Guinness candy. The brown sugar is listed twice.I'm just supposed to use half a cup for the syrup, right? The recipe is correct. 1/2 cup of brown sugar is needed for the syrup and an additional 1/2 cup brown sugar is creamed with the granulated sugar and butter. These are awesome. First time my Guinness syrup turned out a little thick so my second batch I just took it off the stove sooner - perfect. Also, changed the chocolate chip measurements 'cause I'm a sucker for dark chocolate and I'm not crazy about white. Everyone is loving these cookies, great recipe!